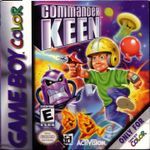 Play as Commander Keen on an alien world. Run, jump, and shoot your way out of harms way as you navigate an alien world that is out to destroy you. Source: Wikipedia, "Commander Keen (video game)," available under the CC-BY-SA License.